My birthday was April 7th. 27 years old, oh dear. Is that ‘late twenties’? I think it probably is. 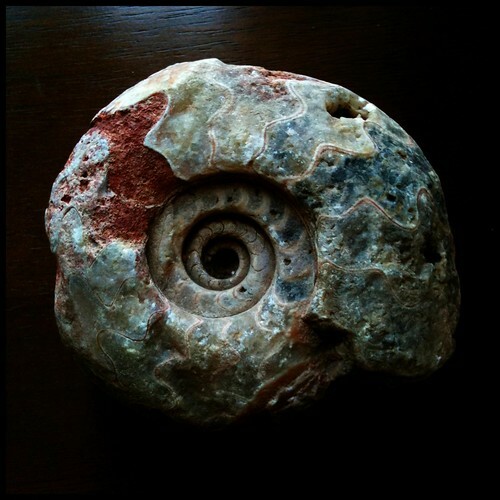 One of the amazing gifts my family got for me was this large, unusual ammonite fossil. I’m not an expert, but in my many years of ammonite collecting and perusing I’ve never seen one quite like it. I took these shots of it today with my iPhone and processed some of them (the first and third above) with a new photography app called Camera+. I love it — lots of photo taking and postprocessing options. This entry was posted on Saturday, April 9th, 2011 at 11:54 pm and is filed under collecting, photography. You can follow any responses to this entry through the RSS 2.0 feed. You can leave a response, or trackback from your own site.